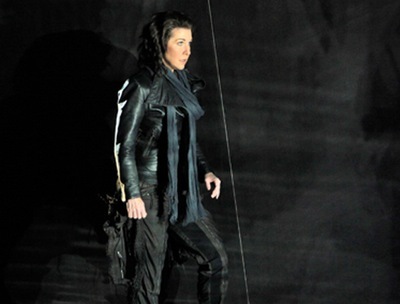 American mezzo-soprano Joyce DiDonato returns to the San Francisco Opera this month as Romeo in I capuleti e i Montecchi. The SFO's audiences will remember her thrilling Rosina in the 2003-04 production of Il barbiere di Siviglia - a role she has since recreated countless times in her imitable manner - as well as her bold debut as Der Rosenkavalier's Octavian in 2007. Her rise to prominence could not be much more complete. DiDonato has done a phenomenal amount in the last decade, and is routinely described as one of the most important singers of her generation. This year she adds to her list of accolades a Grammy and a recent Classical BRIT Award nomination for her solo album Diva Divo. Photos from the SF Opera production: Cory Weaver.